When asked about The Junior League, Martha Rivers Ingram said, "I never expected to find myself serving as Chairman and CEO of a major American corporation. You may never expect to run a business, to be head of a household, or to lead a nonprofit board. Yet, effective Junior League training can prepare you for these experiences and many others." She became a corporate chairman upon the unexpected death of her husband, who ran his family’s business, Ingram Industries, but her life as a civic leader preceded her business career. A member of the Junior League of Nashville in the 1970s, Martha was an early and energetic supporter of the idea that Nashville should become a regional cultural center. By 2000, the Tennessee Performing Arts Center had an endowment of over $20 million, which allowed more than a million Tennessee children to experience symphony music, drama, and dance. Her love of the performing arts began at Vassar College when she became a classical music DJ, assuming the pseudonym of Elizabeth Crawford and lowering her voice to conceal her youth. As a Provisional in the Junior Leagues of Charleston, South Carolina, New Orleans, and Nashville, and as a Nashville Active member, she learned how to share her love of music with an even greater audience. That love of the arts can be seen in many of her other activities. Martha serves as a board member of the Spoleto Festival USA, the Tennessee Repertory Theatre, Tennessee Performing Arts Center, Nashville Opera, and Nashville Ballet. She is also the Chairman for the Nashville Symphony Association, and the Vice-chairman for the Schermerhorn Symphony Center, which she was instrumental in founding. 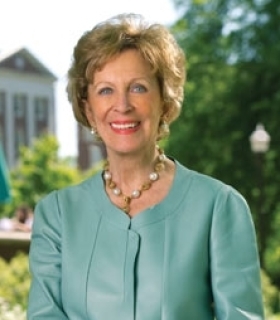 Martha is a former Chairman of the Board of Trust of Vanderbilt University and an active supporter of the Vanderbilt Blair School of Music. She has received the Community Foundation of Middle Tennessee’s Joe Kraft Humanitarian Award for her philanthropic efforts and was honored by the Americans for the Arts for her exemplary national leadership, which demonstrated extraordinary artistic achievement. She also received the Eli & Edythe Broad Award for Philanthropy in the Arts.